This activity accompanies the Counting Snowflakes song from Ho Ho Ho Christmas Songs for Kids. Directions: Color snow globe, tree, and snowman. 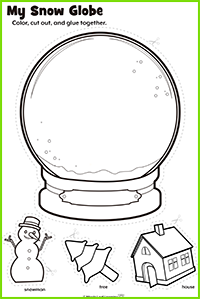 Cut out the items and glue them on the snow globe. Alternatively, draw anything you like in the snow globe!